When I was just a kid visiting Waikiki (the 80’s and 90’s), I remember the International Market Place in Hawaii as… well… a bit kitschy. Not in a bad way, necessarily. But, as I wandered around the different kiosks, I didn’t really fully understand its appeal. In fact, some mucky-muck must have thought similarly because, now, the NEW and IMPROVED International Marketplace is about to debut. I, for one, can’t wait to pay my respects to the old venue that paved the way for this newly renovated hot spot! 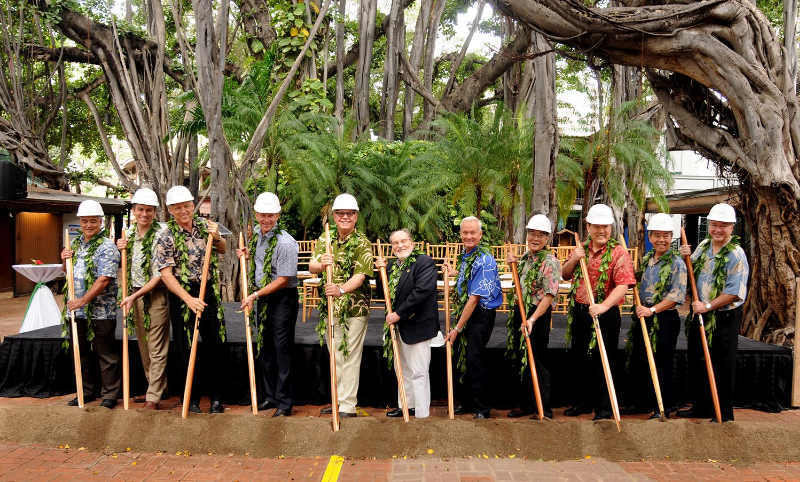 The groundbreaking for the new International Market Place in Waikiki. According to Taubmen Properties, the new International Market Place in Hawaii, which has its grand opening on Thursday, August 25th, will feature an open-air design, featuring a fire tower, a three-story waterfall, an interactive entertainment stage, and a treehouse in an enormous Indian Banyon tree, planted circa 1850. All told, the soul of the “old” International Marketplace lives-on, but the “new” venue sounds anything but knick-knacky! During the grand opening festivities, you can enjoy entertainment and music all weekend long. Plus, if you’re one of the first 500 guests at the Customer Service Desk between 8:45 am and 9:15 am, you’ll receive a $20 gift card from one of the select Grand Lanai restaurants. 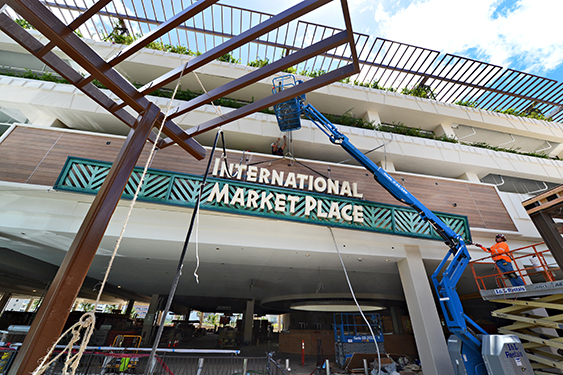 The cuisine will be the big draw at the new International Market Place, with the Grand Lanai restaurants as the main attractions. 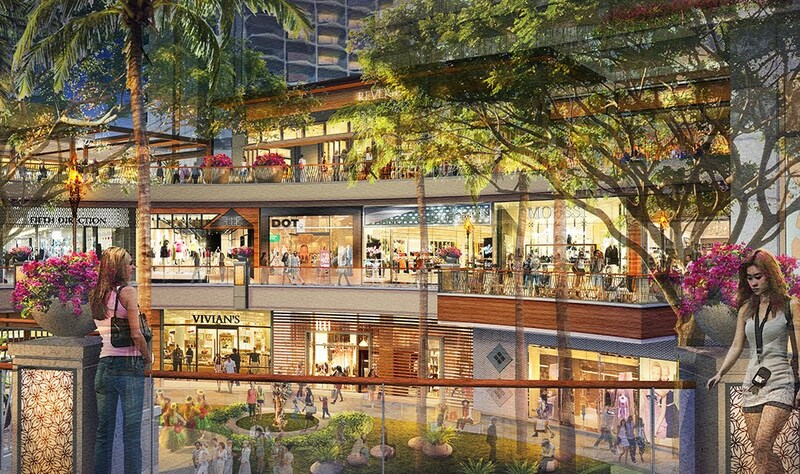 The center will be anchored by Saks Fifth Avenue, the only luxury department store in Waikiki, and the Grand Lanai, which will provide al fresco dining at nine chef-driven and unique restaurants, including Strip Steak by Michael Mina, Eating House 1849 by Roy Yamaguchi, Yauatcha by Hakkasan, Flour & Barley, Kona Grill, Baku Japanese Robata Bar, and Goma Tei Ramen. 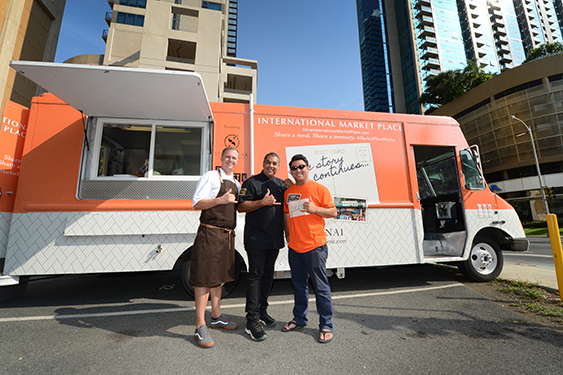 In addition, Michael Mina will operate a gourmet food hall called The Street. 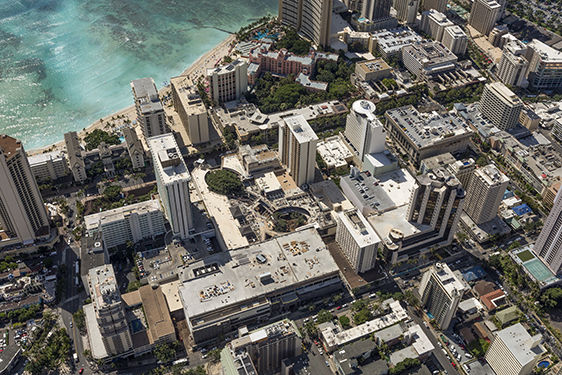 This will be the largest concentration of dining options in Waikiki. According to Taubmen Properties, 80% of all hotel rooms on Oahu (32,000 rooms) are within walking distance. Hawaii Magazine also reports that, unbeknownst to many visitors, the International Market Place’s land owner is the Queen Emma Land Company, and revenue from it goes to the Queen’s Medical Center—a nonprofit acute care medical facility, founded by Queen Emma and King Kamehameha IV in 1859. So, while the International Market Place has always been known as a destination for travelers, it actually serves more than one purpose. A rendering of the new International Market Place shows interwoven trees within the mall. The restaurants and shops in the International Market Place expect about 52,000 – 80,000 people to walk by (or through) every day! And, frankly, that number may not be a stretch — according to Taubmen Properties, 80% of all hotel rooms on Oahu (32,000 rooms) are within walking distance. It’s something to keep in mind when you book your hotel or resort with Hawaii Aloha Travel. Make sure you ask your travel professional if you’re staying within walking distance to the International Market Place in Hawaii — you want to be one of the first to experience this amazing venue! And, here’s more: Taubmen Properties reports that half of the Oahu’s population is located within ten miles of International Market Place, which makes the venue not only a boon for the tourist industry, but also a place for locals to shop ’til they drop. Construction on the new International Market Place began in 2014. Mall hours are daily 10 am to 11 pm. Address is 2330 Kalakaua Ave. I, for one, plan to be among the first to see this new venue. As much as I miss the old, it’s time to usher in the new!